Vintage Leaf Memories - Michael Langlois: Things I miss about old-time hockey…. Things I miss about old-time hockey…. It’s stating the obvious that the sports world has changed rather dramatically in recent decades. Free agency, longer seasons and monstrous contracts (and profits, in many cases) have shifted the landscape for fans, as ticket prices are now often out of the reach for many of us. In sports like football, artificial turf has changed the look and feel of the game. In hockey and football, injuries occur more often and are seemingly more serious. (It could well be that our growing awareness has at least meant more reported injuries.) The equipment itself has created huge problems because more than simply protect, it causes serious damage, too. Everything is so corporate now—advertising all over the boards; in-arena promotions; constant hype. For its part, hockey is the same sport, but it’s a different game. It's so fast, everyone shoots hard now. Players wear armour and work out twelve months a year. And there are so many commercials during the broadcast. Every little thing is sponsored. It’s all about money, and understandably so, I guess. But still, there are things I miss about the old days. Now, the old days for some VLMers may be the ‘90s, while for me it kind of goes back to the late 1950s and into the 1960. But we all have memories of when things were different, eh? King Clancy, who was an ever-present figure in the Maple Leaf organization for decades. He was always good for a hopeful (though not always realistic) outlook on the blue and white. 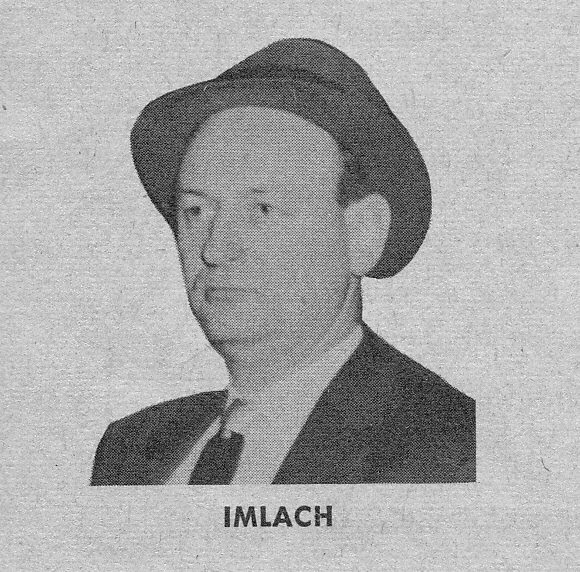 Punch Imlach (above right): love him or hate him, he ran the Leafs for a decade. Some say he should have won even more Cups but he did build teams that won four championships in the '60s. Paul Morris as the public address announcer. Every goal, every penalty announcement was intoned the same way. No phoney drama. Hockey Night in Canada being exclusively on CBC. No criticism of Sportsnet, but HNIC, when I was a kid, was always about Saturday nights on CBC—the National network. (Where I was raised, we didn’t even have a CTV affiliate station—Canadian content meant CBC.) After the game, if I’m not mistaken, “Juliette” (a Canadian production) came on between 10:30 and 11pm. The fact that, in the really old days (at least where I lived in southwestern Ontario) HNIC was the only hockey game you saw all week. It was so special. Today, fans can watch several games a night—all at once. That’s great, but I miss the special feeling around Saturday nights. When the games started at 8pm on Saturday nights. They have switched the time to 7pm now for a variety of reasons, including the desire to have “double-headers” on television. But I preferred 8 o’clock starts. It just felt “right”. Leaf games on the radio from Chicago on Sunday nights, starting "late" at 8:30 my time. When the nearby Red Wings were at home, I'd listen to Detroit games starting at 7 on Sunday night, then flip to the Leaf game at 8:30. A full night of old-time hockey listening. Maple Leaf Gardens. There was nothing like walking into the Gardens on game night, especially against a good team. If the Habs, Bruins or the Flyers were in town in the '70s, the feeling was really something. The old pictures on the walls alone made each visit memorable. The Montreal Forum. I was fortunate to attend a number of games there in the late 1970s. A real hockey shrine, at least to my impressionable eyes—so much history. Just watching games on television from the Gardens or the Forum was great. The old “greys” at Maple Leaf Gardens—a great vantage point to really watch the play develop. The feeling in the air around the Gardens on the night of a playoff game, walking up the subway steps and that sense of building excitement. The interviews that Cornell and Hodge did with players between period, where they and the players could actually sit for a few minutes and have a bit of a conversation—not the rushed, breathless, stand-up Q&A’s we see nowadays. The days when regular-season games ended in a tie. You never heard the word “overtime” until spring—and playoff time. When games simply ended in a tie (still seems like a fair result to me, after 60 minutes) and there were no shoot-outs. Enough said. When the season ended in April/very early May, just as the weather was turning nice. Foster Hewitt on the radio (especially Sunday night Leaf games on CBC radio), and Danny Gallivan doing Hab games on television. For me, they were the best. The Canadiens being so good, because it gave me, as a Leaf supporter, something to hate and a team to root against. The intense rivalries with Montreal, Detroit and Chicago. Before expansion in 1967, teams played each other 14 times a year. It sounds like a lot, but it worked. The Leaf players of my youth: Bower, Horton, Stanley, Duff, Armstrong, Keon, Ellis, Baun, Walton, Pulford and many others. Those guys won championships together. Yes, there were only six NHL teams at the time and you only had to win two rounds in the playoffs to become champions, but those were the best players in the world at the time. The game is faster, probably much better now, in some ways, but I liked the pace of the game back in the early ‘60s. The fact that I knew the names of all the players in the league back in early '60s. Bobby Orr, Jean Beliveau, Henri Richard, Bobby Hull, Gordie Howe. All great Leaf rivals, I hated—and admired—them all. I don’t miss Peter Puck, the early ‘80s Leafs, the Broad Street Bullies, Harold Ballard, Howie Meeker (as enthusiastic as he was), TV broadcasts with a red dot following the puck and assorted other things. But I do miss everything I mentioned above. I found myself nodding along with all your points. Everything seems just too commercial and too hyped these days. Now there is even talk of putting advertising on team sweaters a la soccer...ugh! Although I enjoy and appreciate the internet and the many Leafs blog sites I really miss the excellent sports sections of the three Toronto papers (Telegram, Globe and Star). The writing was far superior to today's and the game pictures were outstanding. I feel for the kids and young adults today who can't afford to go to a game these days. Back in the day a teenager with a part time job could afford season's tickets. I miss Maple Leaf Gardens. It was indeed the hockey shrine. There was not a bad seat in the house. You could stand behind the grey seats and still have a perfect view of the game. I miss the continuity of the old days when one could follow a Leaf prospect through the Marlboroughs or St. Michael's and where many players spent the majority of their career with the same team. I miss the Sunday afternoon double headers.featuring the Marlies and St.Mikes against junior teams with affiliation to the other NHL teams. I guess you can't turn back the clock and I wouldn't want to but it is fun to indulge in nostalgia. Thank you, Michael, for a wonderful column. I wasn't living in Toronto in the days of the junior A double-headers but I saw some great Marlie games in the early '70s, though Ballard didn't have all the lights turned on for the Junior games, at least that's how it seemed. And I agree, following Leaf prospects in those days with the Marlies and St. Mike's was one of the best things about being a fan. Thanks Pete! I absolutely miss the mystique that came with Saturday night Hockey Night in Canada! We had one television station and nothing but a couple dinky local radio stations, it was before cable and satellite, and the instant updates of the internet, so that was the one true time to see the Leafs. I would spend my entire Saturday afternoon bouncing off the walls, waiting for 8 pm and the familiar music theme. It seemed so sad a few years ago to see the HNIC theme dumped by CBC and its rights put up for bidding. Just another reminder of the business that hockey is today. I miss hockey cards. Not the slick, glossy, $5 a pack kind. Our choice then was O-Pee-Chee or nothing. And it did not matter. I could scrounge up loose change from the seat cushions, do the dishes and get another ten cents from my grandmother, and walk a mile down Highway 35 to the general store and plunk down twenty cents in whatever form I was able to add it up, and walk out with a pack of cards. We didn't care about the edges or "mint condition" either. All we knew was that Leafs players and goalies were worth two regular cards in trading, and we would line them up against the wall on the school playground and flick other cards at them to knock them down. I miss Sittler, Salming, McDonald, Palmateer, Williams, Turnbull, Vaive, Derlago, even Rocky Saganiuk, who coincidentally became my son's first hockey coach years later. I had no idea how bad my Leafs were in the early 80s, or the dysfunction that surrounded the franchise. It didn't matter to me, just so long as I could see them play once a week. I miss a time when the players did not have to apologize for skating ten times all summer. They didn't skate once, they were too busy working summer jobs and spending time back home with their families. I certainly miss all the old barns, Maple Leaf Gardens included, that have been replaced by sterile palaces full of corporate suites and suits. Thanks for that, Pete. I, too, looked forward to the Saturday night games, the music, all that came with what was essentially the "Game of the Week". Trading cards: absolutely. I had similar memories (a nickel a pack in my day in the early '60s, I think it was). Empty pop bottles, anything that would net the required amount! I remember the players you mention- they all bring back great memories. And yes, as much as all these new buildings are modern and impressive, none match the feel of the Gardens, Forum, the old Olympia in Detroit, Chicago Stadium, etc. I miss the little player sticker books from Esso. My Dad used to know the local Esso guy and he would always slip me a few extra packs to help fill out my book! I hated the Habs but how could you not love their team in the early to mid 70s, it seemed so complete especially when that rookie goaltender came from now where.... what was his name.... oh yea Ken Dryden..!!! That early '70s Esso sticker book was fantastic, Leafs Fan in Mexico. And those Montreal teams of the '70s were so good- too good! Baun will always be a special player in Leaf lore. Thanks for the link. On behalf of Conn Smythe and Stafford Smythe, as well as the rest of the Smythe family, I would like to extend our heartfelt thanks to those who have expressed fond memories of Maple Leaf Gardens. It was home to us, and we wanted our guests to feel at home too. We loved seeing fathers take their sons to the pictures in the hall. As a child, I had the run of the place before the Marlie games. We slid down the bannisters and raced around the halls. Dad and Tommy used to skateboard around the building. The employees were always good to us as kids, and the players were our heroes. My mother's touches were everywhere too, as well as my grandmothers. Mom's recipes were served in the Hot Stove Lounge, and she designed the usherette's uniforms. We remain profoundly grateful to all the people who came through the doors. Love to Leaf fans around the world from the heart of the matter. Go Leafs! I appreciate whenever you can find the time to visit VLM and leave a comment, Elizabeth. One of the things I should have included (it was on my initial list!) in the things I "miss" is when the Smythe family - Conn, and later Stafford - owned the Leafs and Maple Leaf Gardens. Many of us "older" fans still recall those days fondly. Thank you, Elizabeth. As usual, this sets up a little trip thru nostalgia land. I can relate to statements about taking son to hockey games at MLG. The Marlies (Junior and Senior) were useful as a 10 year old boy and later as a father and minor hockey coach. This started me into some hockey research, on hockeydb. When was first game that I saw in MLG? My father grew up in Brantford, Ontario and decided he wanted to see his buddy form his hockey days play for KW Dutchman. His name was Jack Shewchuk - well it turns out he played for Dutchman in 1949-1950 after playing for Boston Bruins for six years. Bobby Bauer (of Bauer Hockey Equipment) was also on that team. In those days, the Marlie Seniors got both kids on way up, and oldsters finishing off their careers. Often, the juniors (e.g. Danny Lewicki) would get a tryout prior to joining Leafs. Like Pete, I liked the days when you followed players from Junior years until they got to Leafs. I was able to see this even more with the Red Wings as I followed Hamilton Red Wings when we moved to Hamilton area. On my recent trip to Toronto, I visited an old friend who played in the Marlboro system from Minor Peewee to Major Midget and then ended up with Dixie Beehives. He pulled out old photos of these teams. I hadn't realized this, but they used to practice regularly in MLG. What a thrill that would have been. I am with you on the equipment issue. I sometimes wonder whether wearing all this body armour has actually created more injury problems. My memory may fail me, but the old days did not have the number of major injuries as now, despite no helmets and lesser armour. We were either crazy or we had greater respect? Concussions are going to be a major issue going forward in both hockey and football. Between cost and injury fears, this may kill the golden goose. I understand minor hockey registration is down significantly? Any correlation? Hi Ralph (RLMcC)- I enjoyed your comments, as always. It's so interesting when we can look back to those days. You mention guys who played for the Dutchmen; I recall a name like Real Chevrefils, who played very well in the NHL with the Bruins in the 1950s and then played on the local Senior A team in the early '60s, the Windsor Bulldogs. Great memories. The equipment, to me, is an issue. And yes, while I don't know for sure, it strikes me that injury concerns are indeed a reason parents are not enrolling their kids in hockey as much these days. I miss the Gondola (and even the mention thereof) and it's 'occupants' like Foster for some early years and Bill through much of my youth - Brian MacFarlane was also a missed personality. It was great to look over into the 'window' to see King Clancy's smiling face... we always hoped he would have a positive effect on Ballard (and who knows what else might've happened without the jovial sidekick in there with Harold). Paul Morris was surely the iconic voice of Maple Leaf Gardens, as you said, Michael. I actually miss the smaller pads on players and goalies - it would sure be less 'technical' if more desperation was required to make the saves. I'm sure a lot of players don't miss the bruises from the lesser padding, but I think there ought to be 'safer' options so that the pads (shoulder especially) couldn't be used as weapons. I liked overtime being reserved for the playoffs where a tie was a tribute to well-matched adversaries who could always 'settle it' in the playoffs - they almost seemed like a badge of honour, with both teams equally rewarded for their effort, living to fight another day. I miss defensive play (but not the clutching and grabbing) where you had to expect some opposition and use some tenacity to 'soldier on'. I'm not exactly sure how defenders are supposed to do that nowadays - the options seem limited in one's own zone. The speed is fun, but I think it contributes to injuries... wouldn't it be nice to watch a game with clean boards and ice with limited commercial intrusions? Sure would be a shock for modern viewers if they went back to the early 70's format for a game! I miss wooden sticks - even though I'm sure the lighter, snappier ones create their own excitement, I just liked the 'simplicity' of the old sticks. It's funny, InTimeFor62, I preferred the game when not everyone skated a million miles an hour. And the speed of the game, with the equipment, have surely added to the injury outcomes. Yes, fewer commercials, wooden sticks. We can't go back, though I wish we could! Mr.Langlois, I am 74 yrs. old, and have been a Leafs fan since HNIC was first on T.V. in the early '50,s. I am in total agreement with what you wrote, and what other posters have written. Brings back fond memories. Just an aside, did you grow up in the Windsor/Essex County area? The reference to the Windsor Bulldogs of the old Senior A, OHA maded me think so, just a guess. Hi JRRSr.- thanks for the note. Yes, Essex County was home. Lots of Hab, Leaf and Red Wing fans in those days. I miss the wooden sticks too. I still use wooden sticks only. But there is one particular thing I miss and you don't have to go so far back in time to find some players who did that: wearing their sweaters with pride. Today it is all about the money and there seem to be a lot of other things that seem to be more important to players than wearing their sweater with pride. I also miss most of the items mentioned by you and everyone else. I also remember, like it was yesterday, the excitement of walking up the stairs and coming out of the subway at Carlton. Once in Maple Leaf Gardens (MLG), I remember making a bee-line for the closet souvenir booth to see what I might be able to afford with my allowance - I had a real soft spot for the little wooden hockey sticks with the black and white head-shots of the popular Leafs. I miss the loooong escalator rides up the greys. I miss the older lady a few rows down from where we sat who used to scream at Jim McKenny to "get a hair cut McKenny" every time he used to make a bad play. But I especially miss Maple Leaf Gardens itself! What a great building to see a hockey game in.